Tronc Inc., publisher of the Los Angeles Times, New York Daily News and other U.S. newspapers [Chicago Tribune], was among those that blocked readers in the European Union from accessing sites, as they scrambled to comply with the sweeping regulation. “We are engaged on the issue and committed to looking at options that support our full range of digital offerings to the EU market,” the company said in notices it displayed when users attempted to access its news sites from the EU on Friday morning. Others U.S. regional newspapers owned by Lee Enterprises Inc., as well as bookmarking app Instapaper, owned by Pinterest. 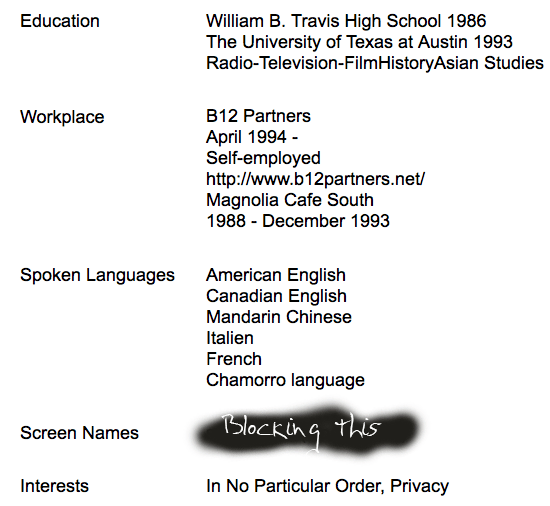 Inc., were also blocking access in the EU. The EU’s General Data Protection Regulation foresees steep fines for companies that don’t comply with the new rules, aimed at giving Europe-based users more control over the data companies hold on them. Tronc and many other digital news organizations are among the worst offenders of collecting information on consumers. Using this article at the WSJ as an example, Ghostery reports 24 different cookies/trackers being served to a reader, from Facebook, Google, DoubleClick, and so on. I’m a subscriber, and WSJ still allows companies like Bombora to shovel my information into their corporate maws. 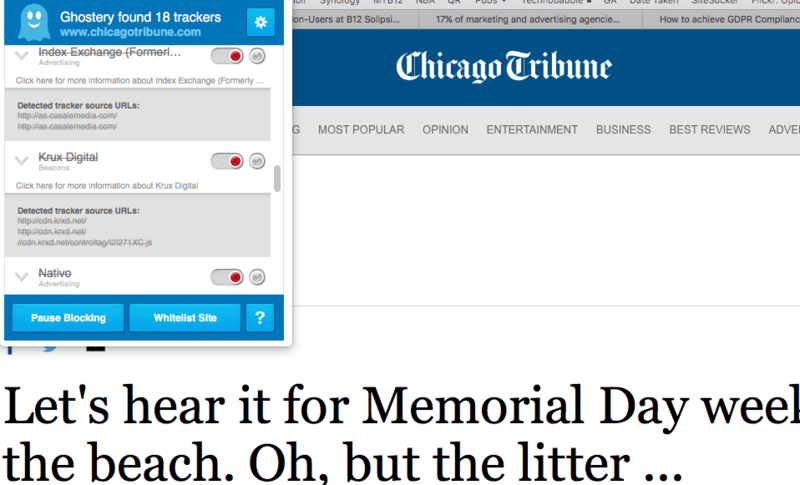 Going to a random Chicago Tribune article, say for instance “Let’s hear it for Memorial Day weekend at the beach. Oh, but the litter …”, and Tronc is serving me, a subscriber, 18 cookies/trackers from various entities, like Amazon, Google, and a plethora I’ve never heard of. My print newspaper doesn’t track me like this. So, I’m not surprised that many news organizations are not in compliance with the new GDPR regulations, I’m only saddened that the US doesn’t have a similar protection for consumers. Savvier consumers can install anti-tracking services, like Ghostery, but what about everyone else? Kevin Crull, chief operating officer at Sprint, envisions a world in the coming years where his phone is able to automatically book an Uber ride from an airport based on a calendar reminder that he created about an upcoming flight. The calendar reminder feeds real-time travel stats to his device and then recommends a meal for his Uber driver to pick up on the way based on what items he has previously ordered through Uber Eats. “I can see in the future where it brings in information from other devices and third-party services to get much more predictive and successful in how we’re targeting people,” he said. Crull’s futuristic scenario isn’t just wishful (or hungry) thinking. It’s the product of 5G technology that constantly pings data back and forth between smartphones and connected devices, making it possible for devices to essentially predict what actions a consumer takes. At its core, the widespread rollout of 5G promises to increase connection speeds by up to 10 times while cutting latency by a factor of five, he said. Videos—and commercials—powered with 5G will stream faster and look crisper on smartphones. And with more data flowing quickly between networks and devices, the so-called Internet of Things will take a bit more shape for marketers who have long strived to ping a user’s smartphone with a relevant message as he passes a billboard or store. Here’s the nub: 5 G as a technology is not necessarily better for average users, but it sure is for the industries that want to monetize your information and sell it, and you, to corporations. By the middle of next year, Sprint plans to have 5G up and running “in many markets,” while AT&T plans to equip 12 markets including Atlanta and Dallas with mobile 5G this year. T-Mobile says that it’s on track to have 5G rolled out to 30 cities such as New York and Los Angeles in 2018, and Verizon is also enabling five markets including Sacramento, Calif., with the technology. For advertisers, 5G opens up new video opportunities with formats like virtual reality and interactive clips that require hefty amounts of data to view today. Sprint’s Crull said he also expects for advertisers to play with dynamic creative and video lengths that are customized to users depending on how much content they typically watch on their phone. And as Apple, Facebook and Snapchat invest in augmented reality, expect for 5G to open up more detailed AR experiences for marketers to experiment with, said Malmad. “In a world of 5G, you aren’t going to be constrained by [bandwidth]—you can showcase whatever you like and have a rich, deep experience, so I do believe that augmented reality will benefit greatly from 5G,” he said. Malmad said that 5G will also make it easier for marketers to target ads to connected cars, particularly once autonomous driving becomes more mainstream. For example, self-driving cars are expected to free up people’s time and attention so that they can watch TV or stream programs, meaning that automakers may build screens into seats. No wonder telecoms are forcing municipalities to install 5G towers, whether or not communities want them, with the help of the Republican FCC chairman, Ajit Pai. The future of cellular service is coming to a neighborhood near you. But who gets to decide when, where and how it gets delivered is still a heated fight. The new technology, known as 5G, delivers wireless internet at far faster speeds than existing cellular connections. But it also requires different hardware to deliver the signals. Instead of relying on large towers placed far apart, the new signals will come from smaller equipment placed an average of 500 feet apart in neighborhoods and business districts. Much of the equipment will be on streetlights or utility poles, often accompanied by containers the size of refrigerators on the ground. More than 300,000 cell stations now provide wireless connections, and 5G will bring hundreds of thousands — perhaps millions — more. The prospect of their installation has many communities and their officials, from Woodbury, N.Y., to Olympia, Wash., insisting that local governments control the placement and look of the new equipment. They say that the cell stations could clutter neighborhoods with eyesores and cost the communities a lot of potential revenue. “Residents across the country are just now beginning to understand the harms that hasty and insensitive small cell deployments can inflict on their communities,” said Jim Baller, the president of Baller Stokes & Lide, a law firm in Washington that represents municipalities on communications issues. But telecommunications companies — hoping to cash in on what is predicted to be $250 billion in annual service revenue from 5G by 2025 — are pushing to build the system as quickly and cheaply as possible. And they have the federal government on their side. And the F.C.C., under the leadership of Ajit Pai, its Republican chairman, has strongly encouraged weakening regulations to accelerate the deployment of new 5G technology — including reducing the role of local governments. Texas cities can’t negotiate rates. Last year, the State Legislature passed a law pushed by AT&T that allows cities to charge carriers no more than $250 per pole each year. Before the law, cities often charged $1,500 to $2,500 a year per pole, and the change will cost Texas cities as much as $1 billion over eight years, the Texas Municipal League estimated. A group of Texas cities led by the city of McAllen, near the Mexico border, filed a lawsuit last year against the state, arguing that the new cell-site law violated the state Constitution, which prohibits the Legislature from forcing cities to grant something of value to corporations. Yeah, Facebook doesn’t want to really discuss this key aspect of their business in public: all their wealth is based on the mining and reselling of their users data. It was never a hidden fact, it was always known to anyone who bothered to ask, but Facebook doesn’t really like to explain it so that the majority realize they are the product being sold. So let’s be clear, Facebook, Snapchat, Instagram, and Twitter even2 only exist to collect data about their users, and use information gleaned from their users to sell to corporations, or governments, etc. That is the model. If everyone, including your grandmother, and my 14 year old nephew understands this basic fact, we’ll all benefit as a society. No Need To Look The Other Way. …But the abuse of Facebook’s search tools — now disabled — happened far more broadly and over the course of several years, with few Facebook users likely escaping the scam, company officials acknowledged. The scam started when hackers harvested email addresses and phone numbers on the “dark Web,” where criminals post information stolen in data breaches over the years. Then the hackers used automated computer programs to feed the numbers and addresses into Facebook’s “search” box, allowing them to discover the full names of people affiliated with the phone numbers or addresses, along with whatever Facebook profile information they chose to make public, often including their profile photos and hometowns. Names, phone numbers, email addresses and other personal information amount to critical starter kits for identity theft and other malicious online activity, experts on Internet crime say. The Facebook hacks allowed bad actors to tie raw data to people’s real identities and build fuller profiles of them. Developers who in the past could get access to people’s relationship status, calendar events, private Facebook posts and much more data will now be cut off from access or be required to endure a much stricter process for obtaining the information, Facebook said. Until Wednesday, apps that let people input Facebook events into their calendars could also automatically import lists of all the people who attended the events, Facebook said. Administrators of private groups, some of which have tens of thousands of members, could also let apps scrape the Facebook posts and profiles of members of those groups. App developers who want this access will now have to prove that their activities benefit the group. Facebook will now need to approve tools that businesses use to operate Facebook pages. A business that uses an app to help it respond quickly to customer messages, for example, will not be able to do so automatically. Developers’ access to Instagram will also be severely restricted. Facebook is banning apps from accessing users’ information about their religious or political views, relationship status, education, work history, fitness activity, book reading habits, music listening and news reading activity, video watching and games. Data brokers and businesses collect this type of information to build profiles of their customers’ tastes. Heck of a network you’ve created, Zuckerberg. There is no way to put this information back into the bottle, the only thing left to do is protecting future information from being harvested, and perhaps punishing Facebook for its lackadaisical approach to protecting the world’s personal data. Shut them down! Speaking for myself, I don’t feel too worried, I always was a bit leery with giving Facebook access to my actual information. They do have my birthday, and where I went to school, but nearly everything else I put in my profile was faux information, or things available elsewhere. For a long time, I’ve used the Facebook API and other tools1 to automatically post photos from Flickr, Instagram, blog entries, etc. But who knows, perhaps I wasn’t careful enough to always delete my Facebook cookies, and so they scraped more information about me than I know. I did use the Facebook app for a few months before deleting it off of my iOS devices, but all it takes is a moment of unguarded attention, and the freaks at Facebook will vacuum up everything not nailed down. So the dark web may know more about me than I know. Sure, sure. I bet that will solve everything. Laura Ingraham, a Fox News host, apologized under pressure on Thursday for taunting a survivor of the school shooting in Parkland, Fla., as at least eight companies confirmed they would pull advertising from her show. In response, Mr. Hogg, who has rapidly become a prominent advocate for gun-control policies, called on Ms. Ingraham’s advertisers to boycott her show. Eight of the companies, TripAdvisor, Wayfair, Hulu, Nutrish, Johnson & Johnson, Nestle, Atlantis Paradise Island and Stitch Fix, said they were removing their ads. A ninth, Expedia, said it had recently pulled its advertising but declined to say when. Until Fox News loses all of its blue chip advertisers, the show will go on. The target may change with the ebb and flow of the news, but the vicious Fox tone will remain the same. As frustrated as advertisers may be with Facebook these days, a bigger challenge may be finding a suitable alternative. Whether many will actually try to do so remains the $55 billion question. That is what Wall Street currently expects Facebook to generate in advertising revenue this year. It is a big number that also happens to be 37% higher than what the company generated in ad sales last year. For comparison’s sake, Google’s ad business was growing about half as fast when it was the same size. Perhaps most notable is that the majority of analysts haven’t brought down their projections for Facebook’s ad business even as controversy has engulfed the company over the last two weeks. Many instead are taking a wait-and-see approach. Questions over Facebook’s handling of user data has sparked an online campaign to #DeleteFacebook. But little is known now about whether that is having any effect. Facebook’s next quarterly report—likely about a month from now—will be the first real opportunity to see if users are fleeing or largely sticking around. In the latter case, most advertisers likely will too. As controversial as Facebook may be right now, its scale and reach make the platform unique among advertising channels. The social network ranked highest in terms of return on investment among online advertising platforms in a survey by RBC Capital Markets. Interestingly, most of the survey took place in the latter half of March as the negative headlines about Facebook piled up. RBC analyst Mark Mahaney noted that Facebook even managed to edge out Alphabet Inc.’s Google for the top ranking for the first time. Facebook plans on riding out this wave of bad PR, just as they have in the past. As long as people continue to use Facebook, and willingly be the product that is sold to advertisers, Facebook will continue profiting off your clicks. As Vox writer Matthew Yglesias notes, Google collects as much or more information on us, yet they in return give something useful. Google search is the best search engine, usually, and Gmail is a good, free mail. What does Facebook offer in return for selling your data? A place to share photos of your children? A place to argue about politics? Why can’t that be done in the same way it was done before Facebook? The main selling point of Facebook is that it has a built-in audience for your content. But is it really worth it? Maybe because I’m a cynical Gen-Xer who wrote most of my college papers on a typewriter, but I wouldn’t miss Facebook if it vanished, especially if Twitter survived. I’m comfortable emailing people, if I needed to communicate with them. Maybe this sucky blog would start to get decent traffic again? That Facebook’s relentless growth threatens the existence of news organizations is something that should make the architects of that relentless growth feel bad about themselves. They are helping to erode public officials’ accountability, foster public ignorance, and degrade the quality of American democracy. Facebook is actually bad for our media infrastructure, the media infrastructure which is an essential pillar to our democracy. Meanwhile, Facebook is destroying the business model for outlets that make real news. Facebook critics in the press are often accused of special pleading, of hatred of a company whose growing share of the digital advertising pie is a threat to our business model. This is, on some level, correct. The answer to the objection, however, is that special pleaders on behalf of journalism are correct on the merits. Not all businesses are created equal. Cigarette companies poison their customers; journalism companies inform them. And traditionally, American society has recognized that reality and tried to create a viable media ecosystem. The US Postal Service has long maintained a special discount rate for periodicals to facilitate the dissemination of journalism and the viability of journalism business models. Until last fall, the Federal Communications Commission maintained rules requiring licensed local broadcast stations to maintain local news studios. The association between Facebook and fake news is by now well-known, but the stark facts are worth repeating — according to Craig Silverman’s path-breaking analysis for BuzzFeed, the 20 highest-performing fake news stories of the closing days of the 2016 campaign did better on Facebook than the 20 highest-performing real ones. Rumors, misinformation, and bad reporting can and do exist in any medium. But Facebook created a medium that is optimized for fakeness, not as an algorithmic quirk but due to the core conception of the platform. By turning news consumption and news discovery into a performative social process, Facebook turns itself into a confirmation bias machine — a machine that can best be fed through deliberate engineering. In reputable newsrooms, that’s engineering that focuses on graphic selection, headlines, and story angles while maintaining a commitment to accuracy and basic integrity. But relaxing the constraint that the story has to be accurate is a big leg up — it lets you generate stories that are well-designed to be psychologically pleasing, like telling Trump-friendly white Catholics that the pope endorsed their man, while also guaranteeing that your outlet gets a scoop. For a better path forward, it’s worth looking at the actual life of Facebook founder Mark Zuckerberg. He likes to do annual personal challenges, and they are normally sensible. One year, he set about to learn Mandarin. Another year, he challenged himself to run 365 miles. He visited all 50 states and met and spoke face to face with people in each state he visited. He committed to reading a book cover to cover every two weeks. This year, his challenge is to try to fix Facebook. But he ought, instead, to think harder about those other challenges and what they say about what he finds valuable in life — sustained engagement with difficult topics and ideas, physical exercise, face-to-face interaction with human beings, travel. This suggests a healthy, commonsense value system that happens to be profoundly and fundamentally at odds with the Facebook business model. I was curious what exactly Facebook knows, especially since I’ve always been somewhat cautious about what I post there. At least I thought I was careful. Turns out Facebook has a huge list of people from my address book, most of which are not actual friends on Facebook1 or several deceased people. I guess one time Facebook copied my phonebook? A lot of the data is old, and not up to date, but there it is anyway. The Facebook exposé continues at The Guardian. Privacy enthusiasts have known or suspected this was Facebook’s business model all along, it is good to make Facebook’s practices more well known to the general public. As a side note, if you have a few dollars to throw at the feet of The Guardian, they’ve done heroic work on this story, and don’t have a paywall. Support heroic journalism! Regarding George Herbert Walker Bush: Some people are born on third base and go through life thinking they hit a triple.